Having discovered four good sized (think soccer balls) puffballs in our garden recently, I felt compelled to do something new with them. My first thought was to make a lasagna, which I did, but since good lasagna recipes already exist, like this one, I decided to write about something else that didn’t rely on the goodness of tomato and cheese to make it interesting. I also wanted to use mostly ingredients from my garden which at this time of year is relatively easy to do. So although it is lasagna related, I didn’t feel right calling a lasagna, and since it is made of layers, I’ll call it a strata. With so many to work with, I cooked all of them the same way and froze those I didn’t need for this dish or my actual lasagna for later use. If you find puffballs which are ready to eat, not overripe or infested with bugs, pick them, clean them and either cook or dehydrate immediately. They do not store well. For more information on identification etc., refer to this page. The first step is to wash them and peel them. The thick outer coating is easy to remove just by pulling it off. Then slice them in about 1/2 inch thick slices. I prefer to roast them in the oven at 350 degrees as by frying them they tend to absorb too much oil. Just brush them with oil on both sides and roast for about 10 to 15 minutes until they are a golden colour. Once cooled they can be stored in an airtight container in the freezer for at least a couple of months. To make a strata, I hope you will read this as a guide but not feel you have to follow it to the letter if you want to use other flavours. I used a squash puree mixed with butter as I would tomato sauce in a lasagna. I wanted to add a light miso, couldn’t find any and added some tamarind instead which did not make for a very pretty colour. Next time I’ll try miso or nothing at all. For greens, I mixed two packed cups of fresh chopped greens. You could go conventional and use spinach, but I used a mixture of mint, parsley, lambsquarters, mallow and dandelion greens. These I mixed with 500 ml. of cottage cheese, one beaten egg and some salt and pepper. The other layer was made of caramelized 4 large onions and 4 Tbsp of sumac powder. A quick and easy way to caramelize onions I learned recently is to cook the onions in a large frying pan or wok with no oil at first, stirring them as they brown and turn translucent. This takes about five minutes. Then add a splash of oil and the sumac and seasonings and continue to cook, about another five minutes, until they are good and brown. To assemble this dish, I spread half the squash mixture on the bottom, then a layer of mushrooms, a layer of greens, a layer of onions, another layer of each of the latter three and then topped it with the other half of the squash. Bake at 350 for about 40 minutes. I was pleased with the results and found the flavour of the mushrooms stood out better in this than in my cheese and tomato combination. The generous amount of onions and sumac went perfectly with the greens. I highly recommend using mint too. When I make it again the only change I would make is to omit the tamarind which is really just a question of colour. Categories: edible weeds, foraging, mushrooms | Tags: lasagna, puffball mushrooms, sumac | Permalink. Even in times of drought such as we are currently experiencing in this area, the wild greens are flourishing and there for the picking. Our vegetable gardens are still struggling, and as I am not a keen shopper I am happy that our lawn is such a great provider. This recipe is another example of what you can do with some of those nutritious, albeit pesky weeds. And if you don’t have such a lawn, you can find all these in any good foraging spots such as meadows, hedgerows and abandoned areas – even in the city. The main ingredient for this is lambsquarters. This particular weed is most prolific, and as I tidy up my vegetable plots I still have to throw out the bulk of it. I have taken to drying it for use in the winter – in the dehydrator, the oven (at a very low temperature) and even on the dashboard of any vehicle parked in the sun, the most economical method of all. But be careful – vehicles can get really hot, so I had to stir them every hour or so to prevent from burning. I also used young goutweed leaves (top left) to give it a herbal flavour, and some plantain (on the right). The lambsquarters are below the goutweed. At the last minute, after taking this shot, I added dandelion leaves. All these mixed with some seasonings and topped with eggs made for an easy, inexpensive and super nutritious meal – and yes, even delicious! You can add more spices and herbs as you choose, and mix and match whichever wild greens you have growing. This is how I did it. If using plantain, boil it in water for four minutes, drain and set aside. It is tougher than the other greens and will blend with them better if cooked longer. Fry the onion until translucent. Add the garlic and chili and fry another couple of minutes. Add the cumin, salt and pepper. Add enough water to the pan just to barely cover the bottom of the pan. Stir in all the greens and cook at medium heat until they have all wilted completely and the water has evaporated. Break four eggs on top of the mixture, cover the pot with a lid and allow to simmer for about 4 minutes, or until the eggs have cooked sufficiently. Remove from the heat and serve. I sprinkled a little sumac powder on top for garnish. Linked to Fiesta Friday #129; The Not So Creative Cook and Faith, Hope, Love and Luck. Categories: edible weeds, foraging | Tags: dandelion greens, Fiesta Friday, foraged wild greens and eggs, goutweed, lambsquarters, plantain, sauteed wild greens, seasonal, sumac, vegetarian | Permalink. This classic vegetarian North Indian dish made easy can be served as an appetizer or main dish. With a complex blend of spices, mixed vegetables and creamy paneer, it is an ideal dish for experts or novices alike, either to prepare to be served. I undertook the making of this delicious North Indian vegetarian dish in response to a recipe challenge presented by a fellow blogger at Lin’s Recipes. I seldom feature Indian dishes on my blog even though I often do make them, so I was pleased to have an incentive to develop a recipe for my blog with these wonderful flavours. Thanks to Lin and also to Parul at Gharkepakwan who has graciously offered to act as judge. I am bringing this to Fiesta Friday #112 which I am co-hosting with Natalie at Kitchen Uncorked. Feel free to drop by and and see the wonderful recipes, tips and stories contributed by a host of talented bloggers. The title of this recipe says it all. Paneer is simply a fresh cheese, made from strained and pressed yogurt. Tikka refers to the pieces of meat or, as in this case cheese in the recipe. Masala means mixture and in this case refers to the mixture of spices used. I based my recipe on this one, but made a few changes according to what I had on hand. For example, as I am not able to buy ready made paneer in my neighbourhood, contrary to all recommendations on any recipe for this you will find, I had to make my own. Home-made paneer tends to be too soft, and therefore is difficult to mix into the sauce and keep its integrity. However, I found that straining the yogurt, pressing it with a weight to squeeze out as much liquid as possible over a mesh strainer, and then setting it in a very low oven (170 degrees F) for about an hour was all it needed to make it firm enough to cook with. In fact, it was the best paneer I had ever had, but if you can buy it, you can skip this step altogether. I also added sumac powder, not a commonly used spice in Indian cooking but one I use regularly to add a lemony flavour and red colour. To stay with the local theme of my blog I served it with rice made with maple sap, the delicate sweetness of which complements the spiciness of the masala beautifully. Mix the yogurt, spices and flour in a bowl. Cut the peppers into roughly 1 inch squares, cut the zucchini into 1/4 inch rounds and place in a casserole with the paneer. Pour over this the marinade, stir to coat and allow to sit for at least an hour or up to 24 hours. Meanwhile, to make the gravy, chop the onion very finely. A food processor is useful for this process. Fry it gently in about 2 Tbsp of oil until it softens. Add the ginger and garlic and fry for another 2 minutes. Add the tomato paste and spices and continue to cook, stirring frequently until the mixture is quite dry and is like a thick paste which will come away from the sides of the pan. Add the water and cook a further 2 minutes, stirring to make sure it doesn’t stick. Set aside until the vegetables and paneer are ready to be added. Place the marinated vegetables and panner on a grilling sheet and drizzle with a little oil. Place under a broiler and when they start to sizzle, turn them over and broil until they look cooked and slightly browned. The time this takes will depend on your broiler and proximity to the heat. I found it took about 5 minutes per side, but keep a close watch on it. Mix all this with the gravy, reheat and serve it as an appetizer or a main dish with rice or flatbreads. Categories: main dish, spice | Tags: Fiesta Friday, gluten free, how to make paneer, maple sap rice, North Indian cuisine, sumac, tikka masala, vegetarian | Permalink. I have written several posts on staghorn sumac, by far the most common of the red-berried shrubs in this area but by no means the only edible variety. When I accidentally stumbled upon another variety, rhus glabra or smooth sumac, I was interested in finding out just what the differences between the two types is. First I discovered that this smooth variety is actually more common throughout North America than the staghorn. It is also reputed to be more tart. Both varieties ripen in the late summer, but can be picked well into the winter and are perfect for foraging at this time of year. The bushes are bare of leaves, so you have to rely on the berries to identify them. The smooth variety looks very much like the staghorn, but without the fuzz on either the berries or the stems. Here are pictures of both for comparison. Just as I was contemplating writing this post, I came across an article extolling the medicinal properties of the rhus glabra. While my purpose in foraging is purely culinary, it is still of considerable interest to learn about the health benefits of any of the ingredients I use from the wild and this article helped me understand just what a remarkable plant I was dealing with. It is a wonder that with so much of it around it still remains unharvested. I treated it the same as I did with the staghorn sumac. I placed the entire drupes in the oven in a single layer at a low temperature (170 degrees F) for a couple of hours until thoroughly dried. Then I remove as many berries as can be easily scraped off with a knife. These berries get finely ground in a spice or coffee mill, then passed through a sieve leaving a citrusy powder which can be used in everything from soup to nuts! The remaining berries still attached to the drupes are placed in a large saucepan and covered with warm water and left to soak for about half an hour and then strained. In order to extract as much of the flavour and volume as possible, I give them a second soak in boiling water. This liquid can be used to make tea or sumac ‘lemonade’ which is the way it was most often used in these parts in the past. Perhaps my favourite way of using the liquid is by making sumac mead, although I will be publishing another drink recipe within a couple of days which gives a whole new purpose to collecting this prolific plant. Categories: spice | Tags: dehydrating, foraging, smooth sumac, staghorn sumac, sumac | Permalink. Before you leave, please don’t think I have been doing unspeakable things to baby beavers. Most residents of this region would know what I am referring to, but for the rest of you let me explain. Beaver tails are a fried yeast dough, popular especially at this time of year. They were first introduced in the Ontario town of Killaloe in 1978, and have since become a de rigueur winter treat, especially when out skating, especially on Ottawa’s Rideau Canal. I was inspired to make some for two reasons. First, I am contemplating going skating on the Canal, the world’s largest outdoor, natural skating rink in a couple of days, and thinking I would have to have a beaver tail. After all, in this cold weather a 7.8 km skate calls for something, and that is what you get on the canal. That and hot chocolate. The second reason is that tomorrow is Shrove Tuesday. It is traditional to eat pancakes on that day, but I figured a lot of other people would be making pancakes and I had nothing new to offer, so with my skate in mind I thought of beaver tails. I have made baby ones because the enormous ones they serve on the canal are just too much. Also, more small individual ones means more types of toppings. And the toppings are where it gets interesting. As soon as they come out of the pan, they are often sprinkled with cinnamon and sugar, but maple sugar, jams or preserves can also be used to sweeten them. Alternatively, savoury toppings like garlic butter or strong grated cheese are popular. I just sampled a couple with my own backyard fare – a sweet sumac butter on one and maple butter on the other. Dissolve the sugar in the water and add yeast. Let stand a few minutes until it becomes foamy. Mix the yeast with warm milk, egg and melted butter. In a large bowl combine flour and salt. Add the wet ingredients and combine well. Turn out onto a well floured surface and knead for about 5 minutes. Place in a clean bowl, brush with a little oil or melted butter, cover with a cloth and allow to rise to double the size, about two hours. Punch down and form into balls about the size of a small egg. Roll each one into an oblong shape about 1/4 inch thick. Fry in hot oil or lard about two minutes on each side or until they are nicely coloured. You can deep fry them, but I used about 1/12 inches of oil in a small pan to reduce the amount of oil, and that worked fine. Drain and sprinkle or spread liberally with whichever topping you choose. Serve warm. Be sure to roll them fairly thin as they do puff up a lot when fried. The result is a fluffy light pastry with a crisp exterior, something like a cross between a do-nut and a pancake. They can be frozen and reheated, or you could freeze the dough after its first rising in its punched down state and fry them the next day – especially if you plan to have them for breakfast. Have you had a beaver tail? If so, what flavour do you prefer with it? Categories: recipes | Tags: beaver tails, maple syrup, Rideau Canal, Shrove Tuesday, sumac | Permalink. Maple season will soon be upon us so now is the time to put new recipes out there for all the maple syrup enthusiasts. After all, there is much more that can be done with this delicious sweetener than pour it on waffles and pancakes. 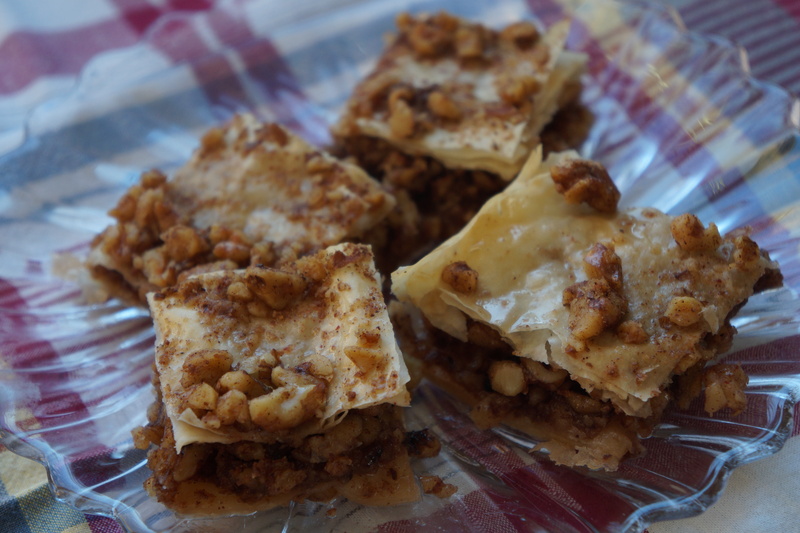 I am not the first to come up with the idea of making baklava with maple syrup as a sweetener, but all the recipes I found on line also added refined white sugar. It is beyond me why one would want to mix maple and sugar since avoiding the latter is one good reason to use the former. To cut the sweetness of the syrup, I used some plain almond milk, but any milk would work fine. This and a conservative amount of syrup resulted in delicious but not overly sweet dessert. If you want it sweeter, you can add more syrup. Walnuts seemed like the logical choice for the filling since they pair so well with maple, but hazelnuts, pistachios or a mixture of any of these would also work well. Chop the nuts and mix well with the spices. Butter the base of a 9″ square pan. Place two sheets of filo pastry in the pan and brush with some melted butter. Repeat this three more times for a total of eight sheets of filo. 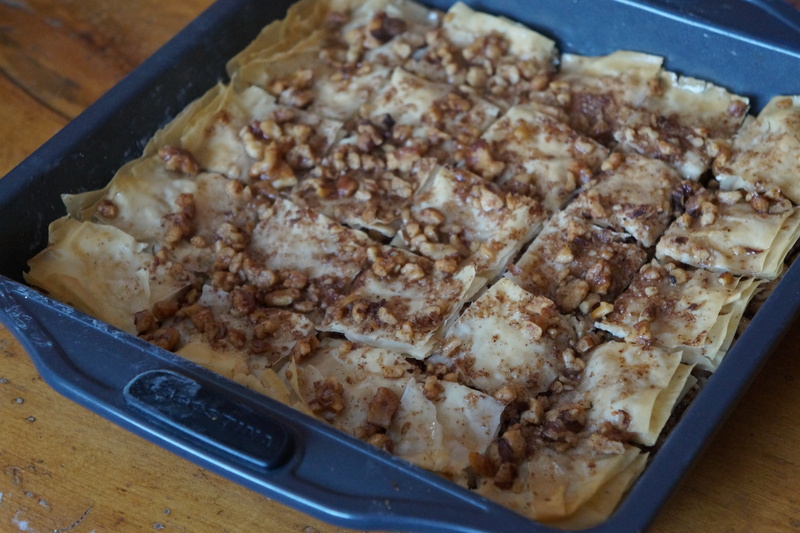 Sprinkle two cups of the nuts over the pastry, then cover with two more sheets of filo. Brush with butter and repeat with two more sheets. Brush the top with more butter and sprinkle the remaining nuts on top. Cut with a sharp knife into squares or diamond shapes. Bake in a 350 degree oven for about 20 minutes, until the top is crisp and golden. Mix and heat the syrup and milk and pour over the pan. Allow to cool. I’m off to Fiesta Friday to share these treats with everyone. A big thank you to our host Angie and co-hosts Suzanne and Sue for keeping the party going. Categories: baking, dessert, edible weeds | Tags: baklava, Fiesta Friday, maple syrup, sumac, walnuts | Permalink. Having successfully made and consumed mead this winter with a simple solution of roughly one part raw honey to five parts non-chlorinated water and allowing it to ferment for two to three weeks, I decided to try it with the sumac juice (pictured above). This juice was made by soaking staghorn sumac berries in water for a couple of hours and straining. I used the juice in the same proportion to the honey and left it covered for three weeks stirring every few days, although it was quite good after two. The longer it is left, the better it is. Once it goes a little fizzy and tastes good, you know it’s ready to drink or store. With the sumac mead, I strained it before serving to remove any of the sediment. If you haven’t tried fermenting before, mead is a great place to start. Nothing could be easier, and it makes a delicious wine substitute. I tried to measure the alcohol content, but haven’t figured out yet how to use my special thermometer for the purpose. Fellow drinkers have guessed it to be about 7%, but I can’t guarantee that. I also have no way of knowing what the PA reading is. I just know it tastes fine – actually much better than fine. It is a tad sweeter than any wine I normally drink, but still light and dry enough to be enjoyed with dinner. The flavour of the sumac adds just a touch of tang to the sweetness of the honey. I must have mentioned the health benefits of sumac in one or more of my previous posts on the subject, but it is worth noting that sumac has many vitamins and minerals including a good amount of Vitamin C. It also has anti-fungal, anti oxidant and anit-inflammaroty properties. Given that it is in its raw state and fermented to boot, I think this might actually be classified as a health drink. Perhaps after this experiment, I will have to try my hand at sumac wine, but this drink is so good I’m not sure it’s worth the trouble. Categories: alcoholic beverage, drinks, edible weeds, preserving | Tags: alcoholic beverage, fermenting, foraging, mead, sumac | Permalink.